When people think of taking their wedding pictures in New York City the first spot that comes to mind is Central Park. I’ve taken thousands of wedding photographs in Central Park during the course of my career. The locations around Bethesda Terrace are some of my favorite spots in the entire park. Just a short twenty minute drive north out of NYC is this little gem. 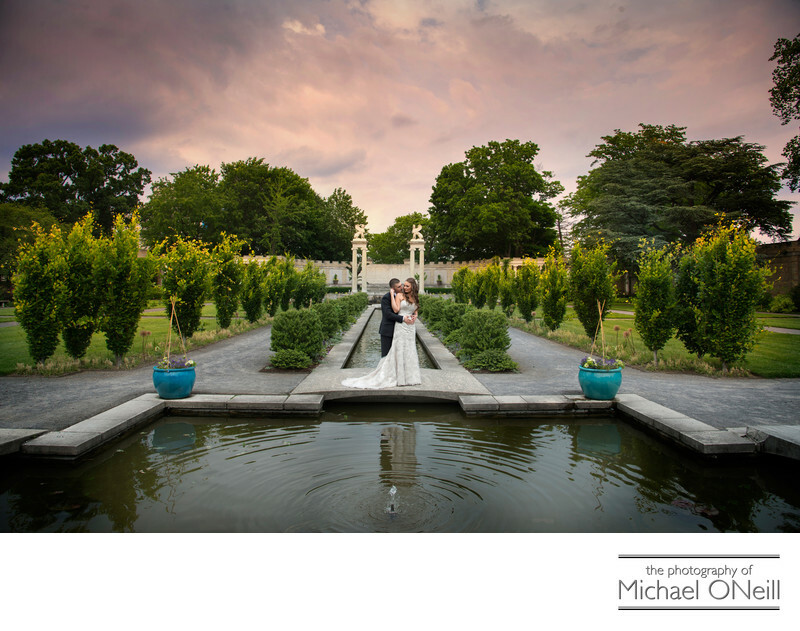 Untermyer Park and Gardens, located in Yonkers, NY is simply an amazing venue for wedding photographs. A stunning rock garden is located just a few steps away from the main parking area. From there you enter The Walled Garden which features dramatic architectural elements, reflecting pools, bridges and the like. This photo was taken inside The Walled Garden on a day when the weatherman was predicting bad weather. The overcast skies coupled with the storm clouds made for some seriously awesome photos. If you are planning to head to Untermyer Park and Gardens for your wedding photographs be sure to allow sufficient time to exploit the beauty of this venue. Choose a photographer who has experience working here in order to insure that you take advantage of the most beautiful vistas.